LavaCon Dublin will be held at the Trinity College Conference Center. Trinity College offers the following accommodations. View on-campus accommodations, campus map, and reserve rooms and apartments. Use the Promotion Code LAVACON2016 to access our block of rooms and apartments. NOTE: Some dates for on-campus accommodations are already sold out. A few hotels are offering discount rates for LavaCon attendees. You can also see other nearby hotels on Google maps. Breakfast can be added for €15 per person. Note: This hotel has other properties in Dublin if the block at The Dean sells out. Dublin is a modern city with a good public transportation system. 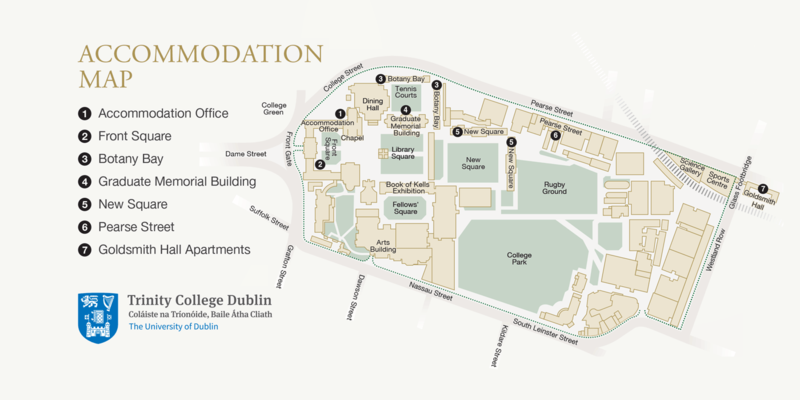 The Trinity College website has directions on the various options for getting to the College: https://www.tcd.ie/Maps/directions.php. Aircoach 700 or City bus 747 pick you up at Dublin airport and drop you off right in front of the main gate at Trinity College. This is the least expensive option, at €10-12 roundtrip. Aircoach is direct. The City bus makes several stops. They are completely redoing the road in front of Trinity College’s main gate. Check the Roadworks page (http://www.dublincity.ie/main-menu-services-roads-and-traffic/current-roadworks-temporary-road-closures) for current closures. Parking is at a premium on campus. Check with the Parking office: https://www.tcd.ie/Buildings/parking.php about permits if you are staying on campus. Pedicabs: If you get tired of walking, pedicabs abound and are relatively inexpensive. They can often get there faster than a taxi as well. Taxicab: There are many taxis in the city centre. Your best bet for getting an empty one is outside one of the many hotels. Consider calling ahead if you need a taxi, especially at peak times. The Green bus: Want to do a bit of sightseeing and don’t have a lot of time? Consider getting a day ticket on the Green Bus. It’s a hop-on-hop-off bus that has stops at all the interesting places in Dublin. The drivers have good stories as well. You can buy a ticket from the driver, but it’s cheaper to book ahead: https://www.dublinsightseeing.ie/citytour.aspx. Dublin’s City Centre and Trinity College are near both the Irish Rail station (Heuston Station) and the DART, which is the local light rail. The DART station closest to Trinity College are the Pearse St and Tara St Stations. The DART runs up and down the coast. Be sure to check current schedules because there are periodic closures for maintenance or other issues.